1. Jenni. "The Official Collection of Fantastical Creature Information." Jenni's Encyclopedia of Fantastical Creatures. 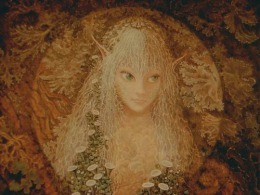 24 May 2008 <http://fantasycreatureencyclopedia.blogspot.com/2007/07/elf-english-mythology.html>. 2. "Elves." Monstrous.com. 24 May 2008 <http://faerie.monstrous.com/elves.htm>.